Sieve flour with baking soda and baking powder twice and set aside. In another bowl, mix yogurt with sugar, oil, vanilla extract and orange zest. Leave until sugar dissolves, about 5 minutes. Add flour mixture and whisk until there are no lumps any more. Transfer into an oiled and floured cake pan. Bake in preheated 390 F oven (200 C) for 10 minutes. Reduce temperature to 350 F (180 C) and bake for another 30 minutes or till a toothpick inserted into the center of the cake comes out clean. 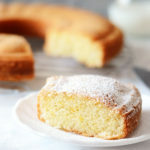 10 minutes before cake is done, brush the top with 1 tablespoon milk (optional).